On the road is where it all happens: the good, the bad and the blown fuses! Working in the motorcycle industry (on or off the road) is unlike other jobs. While attending industry events and rallies, we have the opportunity to meet people from all walks of life. We won’t soon forget the customers we’ve met, many of whom we now call friends! The Custom Dynamics® blog was created as a platform where we could interact with our customers. We’ve always believed in making our customers the priority. The support we’ve received is assurance that our method works. A new feature of the ‘On the Road’ section will be ‘Customer Spotlights’. The posts will highlight bikers like you; our Custom Dynamics® supporters and friends! We’ll learn about the bikes, the upgrades and the people who love them! One of our industry friends is Kris Weiss (Director of Marketing and Promotions at Tobacco Road Harley-Davidson®). 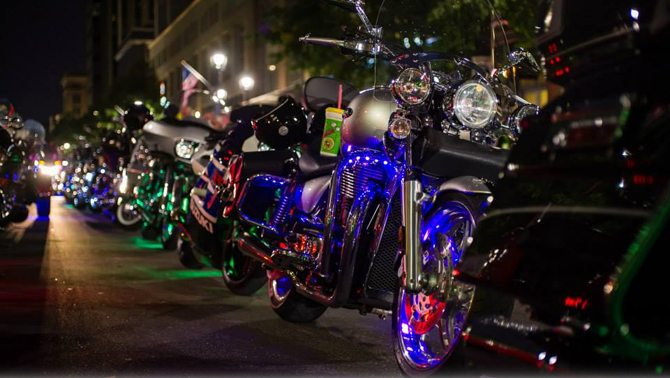 Kris contacted us to light up his 2008 Ultra Classic Electra Glide 105th Anniversary edition, just in time for the Show of Lights parade at the 14th annual Capital City Bikefest! Starting in the front, to maximize his visibility of the road ahead, we installed our ProBEAM® Headlamp and Passing Lamps. To ensure oncoming traffic noticed him, we upgraded the front turn signals with our ProBEAM® Dynamic Ringz™. 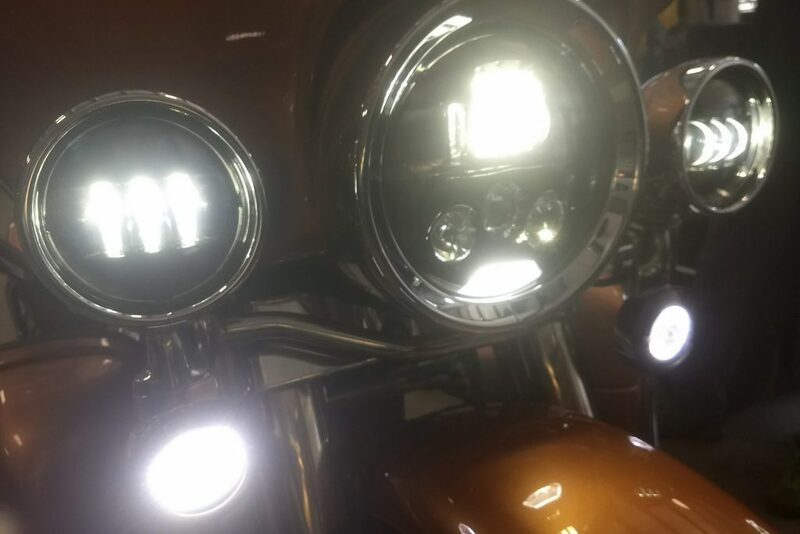 By upgrading the front fender tip to White LEDs, we also achieved a clean White DRL illumination for all the forward-facing lights on the bike. Now the amber turn signal flash is even more noticeable! In the rear, we upgraded the entire system from the fender tip to the Tour Pak. We installed our Magic Tour Pak Converter which adds additional turn signal functionality to the OEM Tour Pak. This was coupled with our Ultimate Tour Pak LED Kit, ProBEAM® Squareback LED taillight and ProBEAM® Red Rear LED Turn Signals. 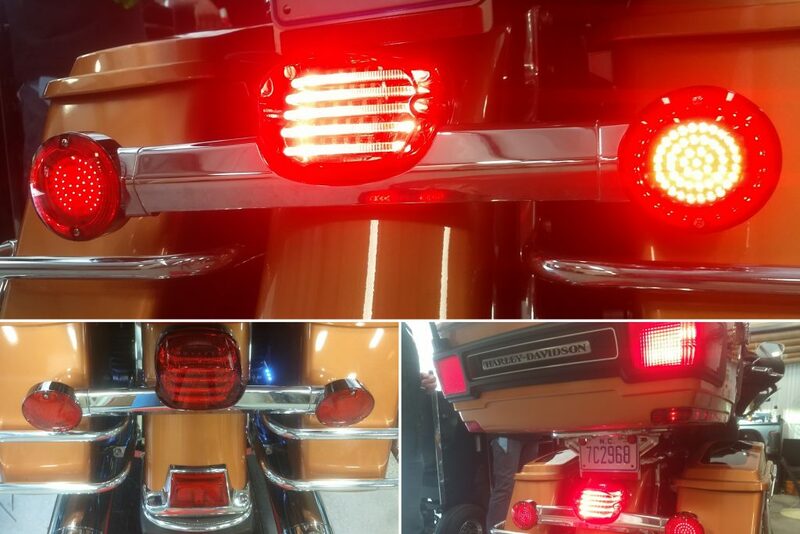 The SMART Triple Play® was incorporated into the system to convert the rear single-intensity turn signals into running lights, brake lights and turn signals with 10 built in brake light strobe/flash patterns for Kris to choose from; if that’s not maximizing visibility we don’t know what is! Why stop there? We also installed Magical Wizards™ for the full bike (front and rear wheel, ground effects and engine). Kris opted for our Bluetooth Color Command Remote which will offer him even more customization options for his color-changing accent lighting! 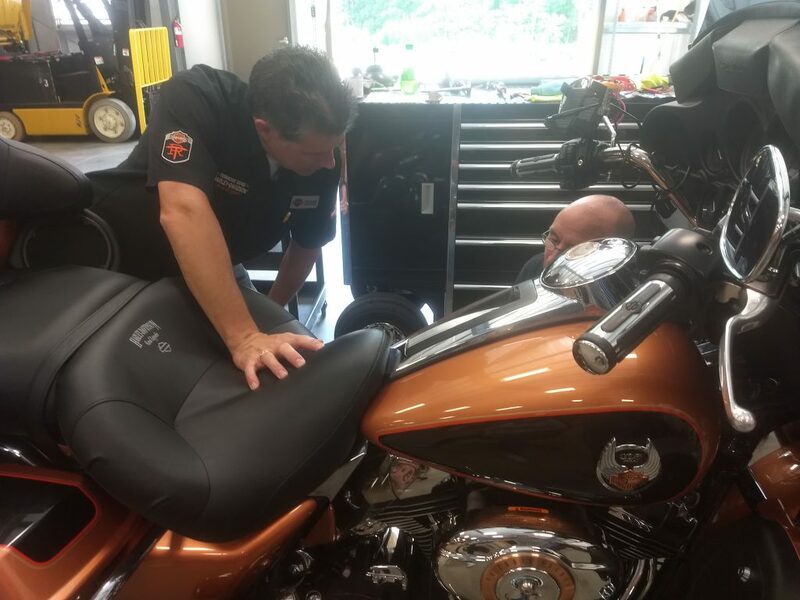 Kris wanted the bike upgraded front to back so, we had a little time to talk while our technicians got busy installing! A common question for riders is, ‘where did it all start?’. For Kris, his first bike came as a surprise! Kris knew he had wanted a bike for a while but hadn’t pulled the trigger on anything. Knowing this, his wife started saving. In April 2006, Kris’ wife surprised him with her secret ‘bike bank’ and Kris became the owner of his first v-twin, a Yamaha V-Star 1100 Classic. If there’s a ‘Wife of the Year’ award, we’re nominating her! Q: What is the biggest benefit of LED upgrades? A: To see and be seen! Safety is the top priority so being as visible as possible on the road is necessary. Obviously converting stock lighting to LED increases the overall brightness but, LEDs also illuminate quicker than an incandescent bulb will. Kris is right, this last detail is commonly overlooked. A turn signal or brake light illuminating a split-second faster gives other vehicles on the road more time to react. While it might not seem like much, it could be the difference between a bad accident and you staying safe. Q: What about your favorite places to ride? Any trips that stand out? A: Being in North Carolina, I’ve done the Tail of the Dragon a few times! My brother also rides so we’ve been able to go to Daytona and Myrtle Beach Bike Week, too. Q: I know you’re excited about all the LED upgrades you’re getting today but, is there anything you’re the most excited to have installed? A: Magical Wizards™ – I love the accent lighting! It all goes back to safety and visibility, having the accent lighting on the bike is a no-brainer when it comes to being seen on the road! Plus, I’m looking forward to being able to customize and change the color of the lights with the Bluetooth Remote. I’m looking forward to seeing all the effects I can use! Working at Tobacco Road Harley-Davidson®, Kris was also happy to talk about this year’s Capital City Bikefest! 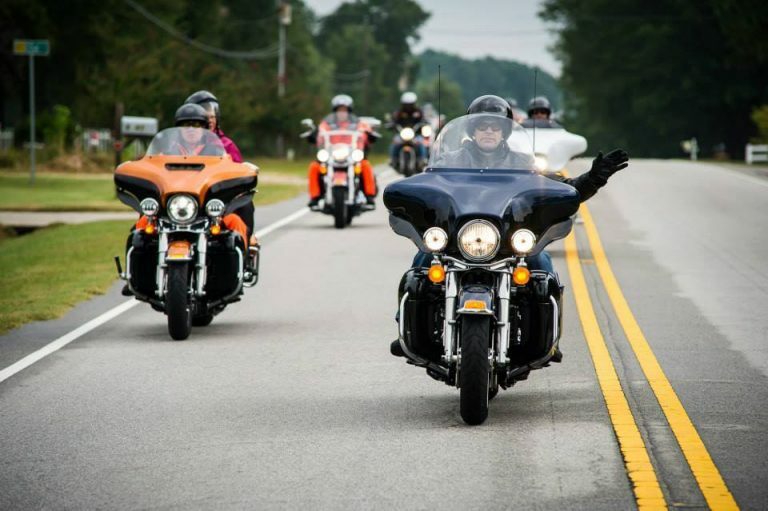 We learned that Capital City Bikefest is Tobacco Road Harley-Davidson’s largest charitable event of the year which is certainly something to be proud of! All proceeds and donations go to the event’s chosen charities: USO-NC and US Veterans Corps! Q: As the Director of Marketing and Promotions at Tobacco Road Harley-Davidson®, I’m sure you’re excited for Capital City Bikefest! What are you looking forward to with this year’s event? A: We’ve got a lot going on this year so there will be a ton of events going on! We’ll have live music, stunt shows including a Globe of Death, a Car Show and a comedian! Plus, there’s Tattoo Fest, the Sound Off Series and the Baddest Bagger competition! There’s something for everyone! Q: This year the event won’t be held on Fayetteville Street as it has been in the past; how will that change things for this year’s event? A: We’ve worked on accommodating the event with two locations: the Raleigh Convention Center and Tobacco Road Harley-Davidson®. Both venues have increased their footprint and their open hours to ensure there’s enough room for everyone to enjoy the events! This year our very popular Parade of Lights will become our Show of Lights, sponsored by Custom Dynamics®! We’ll have registration and prizes, followed by a parade ride through the neighborhood and down Fayetteville Street! Looking forward, we hope that Capital City Bikefest will continue to grow. In the future, we hope to expand the event venues to include local shops/establishments as well! Capital City Bikefest continues to grow each year with 200,000+ attendees expected for 2018! Mark your calendars (September 21st-23rd) and get your lights ready, we’ll see you there! SHOP ACCENT LIGHTS TO GET PARADE OF LIGHTS-READY! After being rear-ended 2 times this year on my 1998 Road King, once while moving and once while at a stop light. 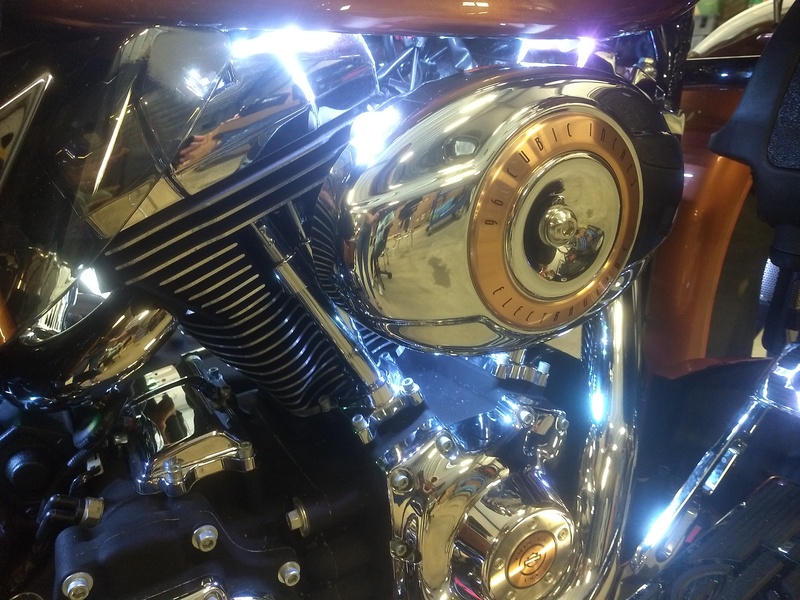 I asked the shop here in McKinney Texas (ThunderChief Garage) about a light upgrade so I could get some respect, or at least become more visible on the road. The are recommending Custom Dynamics. I am looking forward to seeing headlight, passing, tail, fender lights upgraded. I am still on a cane and the bike is a little bent. I think the price will be worth it. I have been riding since 1971 and plan to ride a few more years but I noticed that I don’t bounce as well on the pavement as I did in my 20’s. Back then I was doing 6 volt systems and that is just a step above a candle. I will get back with you after I am lighted up with your product. They mentioned something about the tail lights flash when I hit the brake. That will hopefully get the attention of the people checking their cell phone. BTW both crashes the cell phone was involved. Not me them. We’re sorry to hear about your accidents – two in one year is a lot for anyone, regardless of age! We appreciate the support of your local shop (ThunderChief Garage) and thank you for choosing Custom Dynamics! 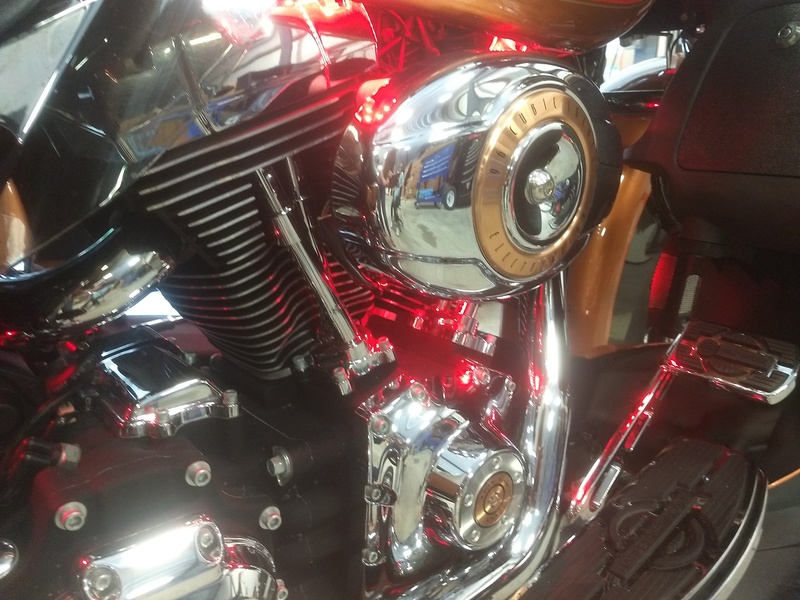 We focus on offering our customers the highest quality LED lighting products and electrical modules available in the motorcycle industry and are proud of the superior quality and performance our products provide! We’re sure you’ll see the difference in visibility right away and, we’d love to hear what you think of the upgrades, once everything is installed! We also strive for top-notch customer support so, if you have any questions or if there’s anything we can help you with, please don’t hesitate to let us know! Thank you again for choosing Custom Dynamics®, have a wonderful week!